This Paleo Slow Cooker Cranberry Maple Beef Roast is going to become a new favourite recipe in your home. Bursting with flavour, and so easy to make this Paleo Slow Cooker Cranberry Maple Beef Roast turns out so tender because it is made in the slow cooker. This Paleo Slow Cooker Cranberry Maple Beef Roast doesn’t require any fancy ingredients or cooking skills which makes it a great choice for those busy weeknight dinners. Can you believe that November is almost over already? Where did the time go? Christmas will be here before we know it. One thing I do love about this time of year is the cranberries that are everywhere! I have been putting them in everything. 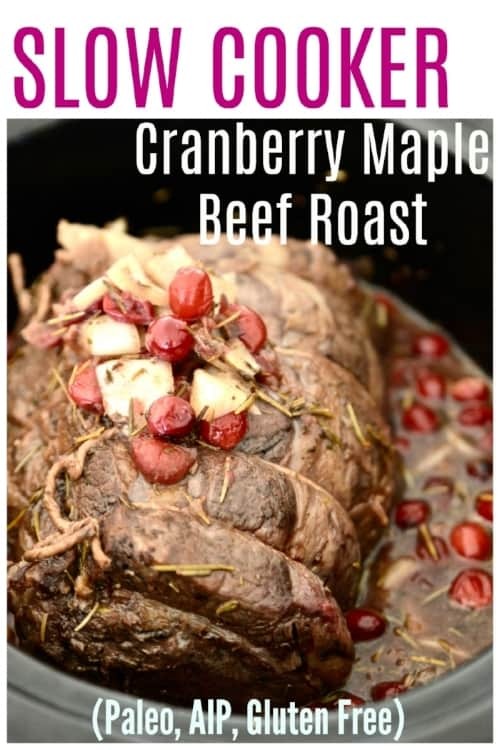 Including this Paleo Slow Cooker Cranberry Maple Beef Roast. Doesn’t that sound amazing? I promise you it is. And because it’s made in the slow cooker it is also super simple. Dare I even say fool proof simple? So it’s back to the grind this week for me. I was away in San Diego for a conference and then on a stay-cation last week which was pretty nice. Although it went by way too quick I must say. I had a lot more I was hoping to accomplish but somehow it just didn’t happen. 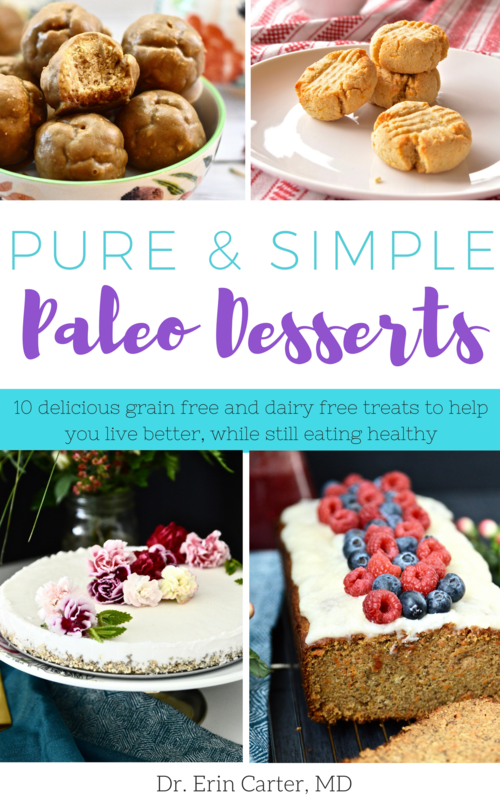 I did get a couple more recipes made for the Paleo Baked Goods Ebook I am working on though. It’s coming along nicely but I have no idea when it will be finished. I keep thinking of more and more things I want to include is the problem. So far there is going to be a breads chapter, muffins and scones chapter, cookies and squares chapter, cakes and pies chapter and then a snacks chapter with recipes like crackers. I am almost done the muffins and breads recipes but I still have a lot more paleo baking to do. I am hoping over the Christmas holidays I can make more of a dent in it as well. My goal is to have it done in 6 months. I wish I could say sooner but I am trying to be realistic. 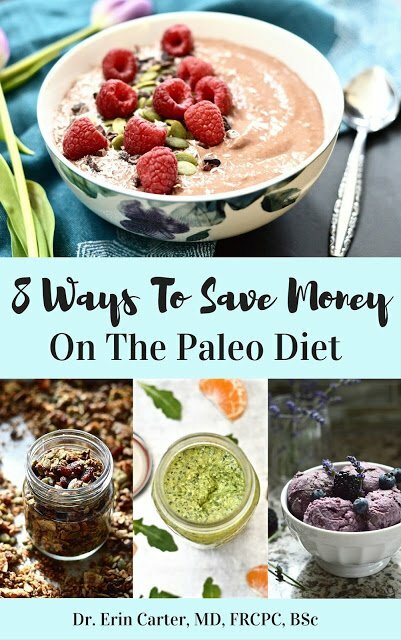 So far there are recipes like Paleo Double Berry Muffins, Paleo Cinnamon Raisin Bread, Paleo Apple Muffins with Caramel Drizzle, Paleo Sandwich bread, Paleo Double Chocolate Zucchini Muffins and Paleo Rosemary Olive Biscuits that are already done. If you are interested in seeing previews of these recipes, I have been sharing them over on my Pure and Simple Nourishment Instagram page almost daily. I also tend to share giveaways and other things exclusively to my Instagram followers so make sure you are following me on there as well. 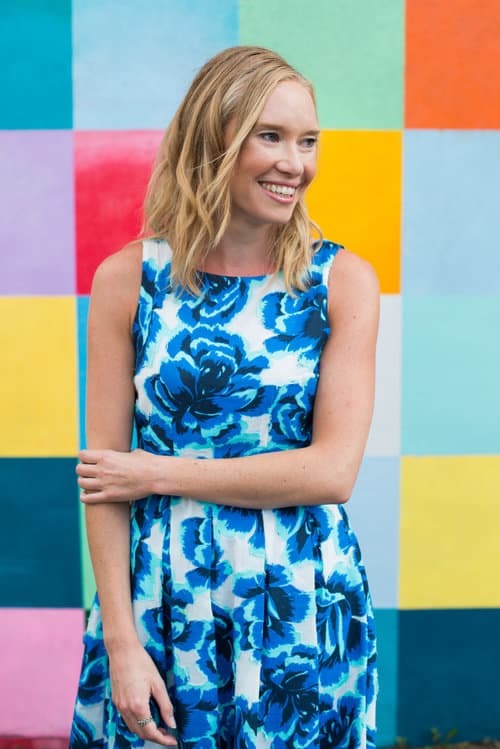 I have included a direct link below where you can head to my Instagram page and sign up. So I started watching this amazing show called Alias Grace on Netflix while I was in San Diego. Have any of you watched it? Well, I went to continue watching it when I got home and figured out that I can’t! It’s not available on Canadian Netflix. What the hell? Sorry but Netflix why do you do that?? Is it really that difficult to provide the same content across different countries?? Grr. It’s like television discrimination or something. Maybe one of you who understands technology better than me can fill me in on why it’s like this. Because this girl clearly doesn’t understand. And yes, I realize there are much bigger issues going on in the world than me not being able to watch a certain TV show. Trust me I know. But sometimes it’s nice to take a little break from all the horrific things happening around us and watch a little mindless television. Right? Do you guys love you slow cooker? I LOVE mine. Really, really love it. 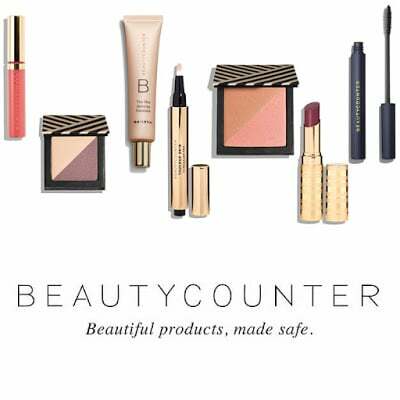 I use it almost every week. Between making bone broth and cooking meals it is almost always on our countertop. I use it so much because it makes meal prep so easy, and the meat always turns out so tender when you use it. 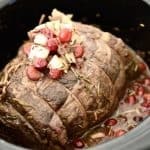 Some of my favourite recipes using the slow cooker are my Slow Cooker Pineapple Pork Ribs, Texas Slow Cooker Beef Chili, Tropical Slow Cooker Pork Roast and now this recipe, Paleo Slow Cooker Cranberry Maple Beef Roast. I have been waiting to share this recipe for weeks. I initially made it during Canadian Thanksgiving which was back in October. And since then I’ve made it twice more. It’s just that good. 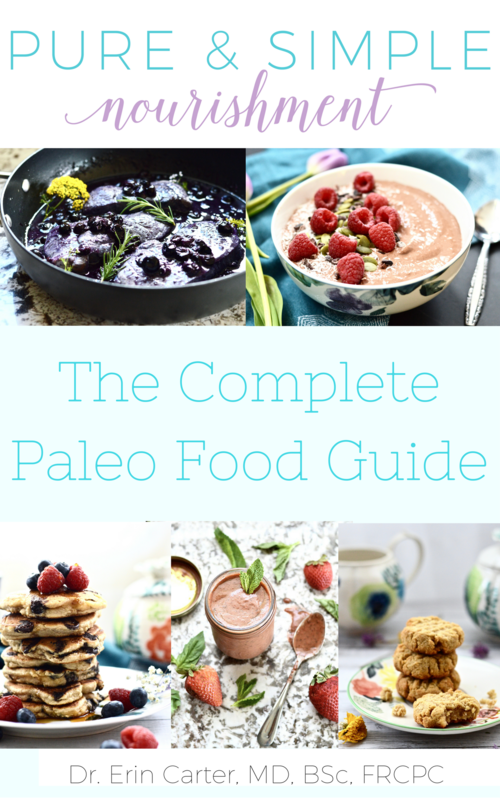 And not only is this recipe paleo, it is also AIP safe and gluten and dairy free. It also uses grass fed beef making it an extremely healthy dish. Did you know that grass fed beef is one of the healthiest foods you can eat? It is loaded with vitamins and minerals and is very high in omega 3 (the anti-inflammatory fatty acid), which most people are lacking these days. I also realize that getting grass fed beef may not be the easiest thing to do. I personally get mine from a local farm that delivers to Calgary about once a month, but I realize not everyone has the time to do this. That’s why I am thrilled to tell you that Butcher Box will actually deliver grass fed beef to your doorstep. How amazing is that? If you are interested in this option, simply head to Butcher Box by clicking here, or click on the box below. I hope you love this Paleo Slow Cooker Cranberry Maple Beef Roast as much as I do. I try and make this on Sunday so that we have leftovers to get us through the week. Because let’s face it. None of us have time to be cooking meals every day. At least I sure don’t. So leftovers are key for us to continue eating healthy, even when we are busy.